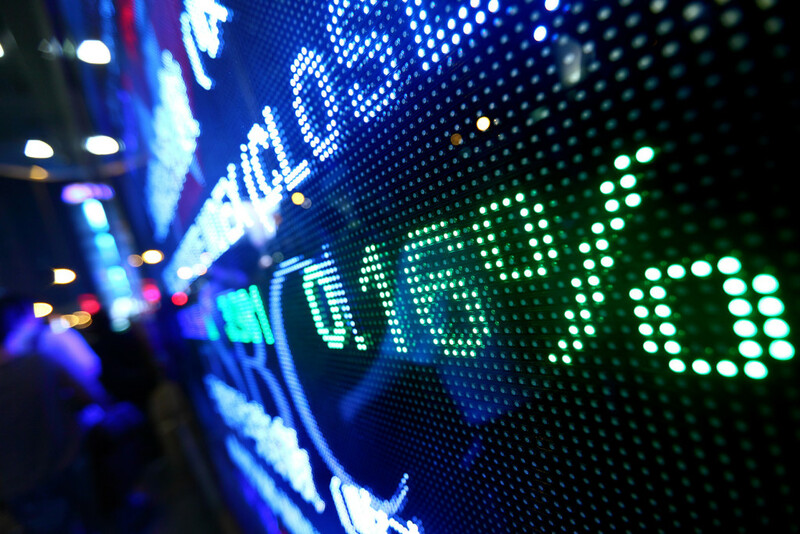 Most investors are frustrated about leaving their futures in the hands of turbulent markets. After the financial crisis, many investors threw their hands up in frustration and chose to abandon traditional asset management practices in favor of guaranteed income. As a fiduciary to my clients, I want what is best for them, and seeing traditional risk-management techniques fail when we most need them led me to search for a smarter way to manage investment risk. Throughout my journey developing smarter ways to manage risk, I spent thousands of hours researching better portfolio management techniques. 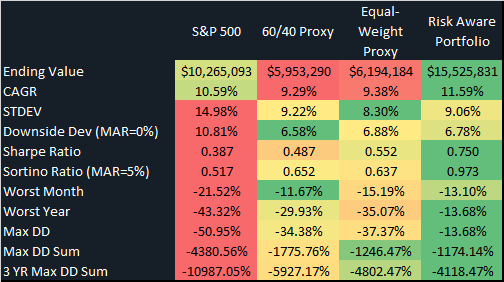 The Risk Aware portfolio that I describe in this article is a simple variation of the type of risk managed strategies that I use in client portfolios. Client portfolios utilize a variety of much more robust risk techniques, but even the simple techniques in this article offer superior risk management over an investor’s typical portfolio. So, if you’re as frustrated as I once was, continue reading because you’re about to learn how simple risk-management techniques can drastically reduce investment risk in your portfolio. Traditional asset management focuses on buying assets across the globe, periodically trading to set your portfolio back to its targets, and of course, buying and holding through recessions. 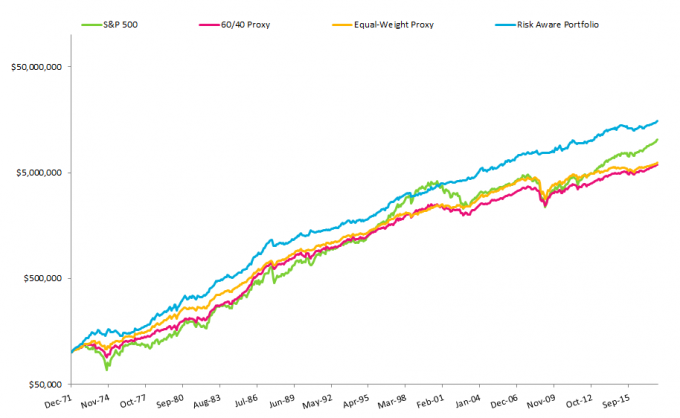 In the past, a portfolio comprised of US stocks, international stocks, and bonds has provided some diversification to reduce risk during recessions. However, in today’s globalized economy, every country’s economy is linked, so international and domestic stocks tend to move together at the same time, at the worst possible times, during recessions. To compensate, traditional investment managers have flooded alternative asset classes that have historically offered diversification during recessions, like commodities, with new money that simply buys & holds. By doing this, the very financial ecosystems they have sought to utilize to reduce investment risk have been disrupted. This has eroded potential returns for buy and hold investors in those spaces. So, with that in mind, what does a next-generation risk management portfolio look like? First we must select a collection of assets that are only loosely correlated. That is, they only have a slight tendency to move in the same direction as one another. Instead of buying and holding these asset classes we are going to apply some simple risk management techniques to help us manage our risk. As mentioned earlier, simply allocating a small portion of your portfolio to each asset class will only offer minimal risk management benefits. This is typically known as a buy and hold portfolio because it requires you to buy assets and hold them for a long period of time to succeed (10 – 20 years). Unfortunately,markets move fast and economic environments change quickly. Most of us can’t wait out a decade of near-zero or negative returns to realize the benefits of a long-term planning strategy. We need to withdraw income during both up-markets and down-markets, which is difficult to sustain for the entirety of retirement when you are forced to sell assets at depressed prices during a recession (which often take back much of the gains from a bull market). Instead, we can maintain a long-term plan to meet our goals and use short-term Tactical Asset Allocation to build a more robust portfolio. By planning for the long term and using short-term adjustments to our portfolio we can maintain our portfolio’s alignment with our long-term goals and help protect our portfolio in times of market turbulence. In contrast with buy and hold investing’s long-term holding period, Tactical Asset Allocation means we are using tactics to make our portfolio decisions. Tactical investing involves short-term assessments and planning that allows you to nimbly switch a portfolio between asset classes, depending on which possess the most desirable risk and reward characteristics. Invest in an asset if its short term momentum plus its long term momentum are positive. Invest in an asset if it is above its moving average. Invest equally in the top 3 ranked assets that also pass both rules 1 and 2. If the total portfolio allocation is less than 100%, invest the remainder in Short-Term Treasury Bonds. Note: Allocations are determined at the end of each month for the next month; e.g. The allocation for December is determined an the end of November, then the returns for December are applied to that allocation. Additionally, momentum just means how large its returns were over a certain period of time. The higher the returns over the period, the higher the momentum. With these five simple rules we are taking advantage of several aspects of human behavior that are expressed within the financial markets. I’ll save the scientific explanations of these behaviors for another time, but as you’ll see in the results section below, these rules offer significant risk reduction within the portfolio. A 100% Investment in the S&P 500 Index. 60% Stocks (30% US Stocks, 30% International Stocks) and 40% Bonds (30% US Aggregate Bonds, 10% Short Term Treasuries) Portfolio. The Risk Aware Portfolio using the simple risk management techniques described above. The portfolio growth and portfolio statistics for the Risk Aware Portfolio are net of an annual 0.89% fee that is deducted on a monthly basis. The other portfolios assume zero fees. Note: This article was originally written in December of 2014 and has been updated as of January 2018. I’ve been updating this each year to reflect the performance of these rules through time, after the initial posting. The results are hypothetical results and are NOT an indicator of future results and do NOT represent returns that any investor actually attained. Indexes are unmanaged, do not reflect management or trading fees, and one cannot invest directly in an index. See disclosures at the bottom of this article for more information. Additional information can be provided upon request. 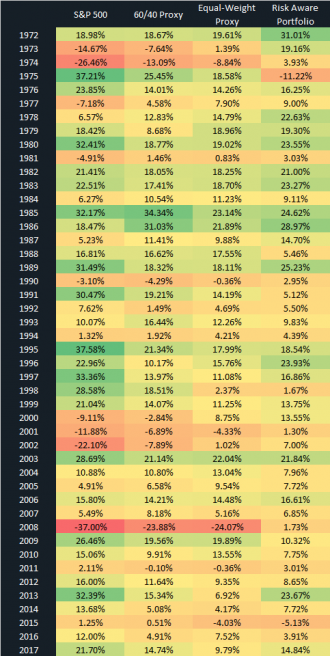 Just like any strategy that has risk management techniques in place, it won’t always outperform the other portfolios, but it offers excellent risk management benefits during recessions with comparable returns during up markets. By avoiding the large losses of recessions, the portfolio can pull ahead of the other portfolios over time. This is due to the way compound returns work. A 10% loss requires an 11% return to get back to even, but a 50% loss requires a 100% return to get back to where it started. Below you’ll find the allocations and return statistics for the various portfolios over the period December 31, 1971 to December 31, 2017. The simulation assumes an initial investment of $100,000 and monthly rebalancing. If you aren’t sure about what the different risk metrics mean, check out my video about how investment risk is measured. The results are hypothetical results and are NOT an indicator of future results and do NOT represent returns that any investor actually attained. Indexes are unmanaged, do not reflect management or trading fees, and one cannot invest directly in an index. The hypothetical Risk Aware Portfolio returns are presented net of an annual 0.89% fee. See disclosures at the bottom of this article for more information. Additional information can be provided upon request. A single tactical asset allocation strategy will perform well in most, but not all environments. Just like any strategy, buy and hold or tactical, there are times when this type of strategy does well and other times when it does not. Certain years this strategy will greatly outperform a buy and hold strategy and other years it will lag behind. If this strategy worked all of the time without any drawbacks, it’s likely much of the strategy’s returns would be arbitraged away. To help cushion the effects of the ebbs and flows of relative performance, we can utilize multiple tactical strategies. Multiple strategies can each be governed by different rules and asset classes. Those different sets of rules and asset classes will perform differently in the various stages of a market cycle. When one strategy underperforms, another strategy can outperform. This is the same idea as diversifying across asset classes so that not all of your eggs are in one basket. By building a portfolio of strategies that work together, we can better ride out the market cycle and design more consistent portfolios. Even better, by dynamically allocating across those strategies to target those with the least risk, we can improve upon the diversification effects of utilizing multiple tactical asset allocation strategies. You can learn more about multi-strategy portfolios by subscribing to the Realize Your Retirement newsletter below. You’ll receive a video series that goes into the research behind why tactical asset allocation strategies work and how multi-strategy portfolios can be utilized to provide more consistent returns in your portfolio. Simply enter your email below and you’ll receive this video series and fresh articles as they are posted, directly to your inbox. The results of the Risk Aware Portfolio are based on quantitative backtests. Hypothetical performance results (e.g. , quantitative backtests) have many inherent limitations, some of which, but not all are described herein. No representation has been made that any fund or account will or is likely to achieve profits or losses similar to those herein. In fact, there are frequently sharp differences between hypothetical performance results and the actual results subsequently realized by any particular trading program. One of the limitations of hypothetical performance results is that they are generally prepared with the benefit of hindsight. In addition, hypothetical trading does not involve financial risk, and no hypothetical trading record can completely account for the impact of financial risk in actual trading. For example, the ability to withstand losses or adhere to a particular trading program in spite of trading losses are material points which can adversely affect actual trading results. The hypothetical performance results contained herein represent the application of the quantitative models as currently in effect on the date first written above and there can be no assurance that the models will remain the same in the future or that an application of the current models in the future will produce similar results because the relevant market and economic conditions that prevailed during the hypothetical performance period will not necessarily recur. There are numerous other factors related to the markets in general or to the implementation of any specific trading program which cannot be fully account for in preparation of hypothetical performance results, all of which can adversely affect actual trading results.